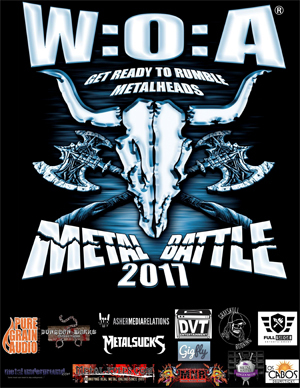 For over a decade at the world's largest outdoor metal festival Wacken Open Air, independent metal bands from around the globe have been performing in front of thousands and competing against one another for one to be crowned champion of the world along with winning multiple prizes (prizes info). For the first time ever, Wacken Metal Battle USA is coming to America for its inaugural year and will be hosting qualifying rounds in New York City, Boston and Philadelphia. The national champion of those battles will perform at the 2017 festival taking place from August 3rd - 5th. Please watch the video trailer below to see all the metal fun! Each city will hold their qualifying rounds plus city finals, selecting the top band to move forward to the national final in New York City (date to be determined) with one being selected to perform at the 28th edition of Wacken Open Air. All bands will be judged during battle rounds by respected local music industry. Your band can easily play a 25 minute set consisting of your own songs. (No Covers). Full set performance time is 25 mins. PA, lighting, and sound engineer will be provided for all bands. The bands must bring their own instruments such as guitars, bass, drum breakables, keyboards and effect pedals and may also bring and use their own guitar amps. Semi playback is not allowed. All bands must play live. Background orchestrations are ok as long as all vocals, guitars and bass are live. Intros / interludes are also ok.
Jury of respected music industry folk will decide the winners each night. If a band overruns its allotted performance-time, then the band-members should be aware of the fact that in this case their sound will be faded out. The running order for the concert will be released a few days before the event takes place. Travel for the winning band to go to Germany is at their own expense and accommodations at the festival will be in the form of camping in the VIP area. Full professional back line will be provided for performance.